Anne Hathaway has officially boarded The Witches remake. Back to the Future helmer Robert Zemeckis is set to direct the new adaptation of the Roald Dahl book of the same name. Zemeckis first became attached to the project in June of last year and now it appears as though the pieces are actually starting to come together, as they have arguably the most important piece of that puzzle in place. According to a new report, Oscar-winner Anne Hathaway will play the part of the Grand High Witch in this new take on The Witches. Hathaway's casting had been rumored for some time, but now the deal is done and she is the first major cast member to board the project. Hathaway will follow in the footsteps of Anjelica Huston, who played the role in the 1990 movie, which was directed by Nicole Roag. The creative team still has some key roles to fill, but this is a big step in the right direction. For those who may not be familiar, The Witches centers on a young boy who inadvertently stumbles upon and spies on a witch coven. He then learns of their plan to turn all children in the world into mice. The young boy is found out by the witches, who then decide to turn him into a mouse to test out their devious plan. Following the unfortunate incident, the boy teams up with some human allies to try and fight these witches and stop them from completing their evil plot. 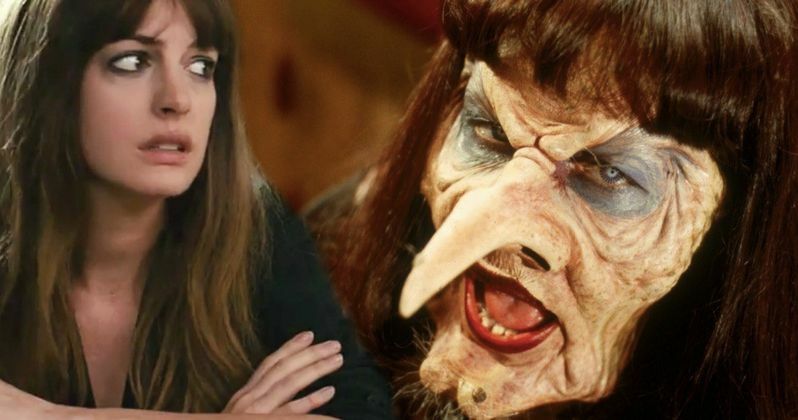 Warner Bros. is behind this new take on The Witches and they also have a good working relationship with Anne Hathaway, who starred in the hit Ocean's 8 for them last year. Hathaway is also set to star alongside Matthew McConaughey in the thriller Serenity this year, as well as the comedy The Hustle. She also recently wrapped production on Netflix's The Last Thing He Wanted. As for Robert Zemeckis, even though he's responsible for some true classics, such as Forrest Gump and Cast Away, it's been a while since he's produced a hit. His latest, Welcome to Marwen, was trashed by critics and bombed at the box office. His other recent efforts such as The Walk and Allied didn't face a critical lashing, but still failed to capture the attention of moviegoers. For what it may be worth, the 1990 version of The Witches has an unblemished 100 percent approval rating on Rotten Tomatoes. Though, it wasn't necessarily a big hit financially at the time. There is no word currently on when the movie may enter production. Robert Zemeckis is also penning the screenplay in addition to directing. To add to the movie's credibility and intrigue, both Alfonso Cuaron (Gravity, Roma) and Guillermo del Toro (Pacific Rim, The Shape of Water) are on board as producers. The Witches does not yet have a release date set. We'll be sure to keep you posted as more details on the project are made available. This news was first reported by Variety.